Work with our large clients on discussing the specs of challenging projects, proposing solutions and managing implementation with a dedicated team of experienced professionals. You will be involved into decision making, estimation, planning and delivery of the projects. We are seeking a Senior Engineer to join our Development Operations team. We apply Agile software development principles and process in engineering, and are aggressively moving toward DevOps culture and process. You’ll have the opportunity to drive exciting projects like configuration management, build automation and infrastructure automation, utilizing our on-premises and cloud (AWS, Azure) infrastructure. Don’t pass up this opportunity to work with talented technology specialists who will appreciate your skills and abilities. Do you want to own the development of our large-scale international E-commerce projects? Do you like discussing requirements, coming up with solutions and delivering it with dedicated Development Teams? Come join us as a Product Owner! We're looking for PHP Developers with different experience (junior to super-senior) to work on large E-commerce and Business Automation projects (ERP/CRM) for large international (USA) and local customers. You'll work in an agile team, utilizing (and contribute to) a lot of open-source technologies. Passionate about SEO, content, analytics, attribution and website architecture, structured data and site management? Join our team to help evolve and strengthen our SEO strategy in an agile environment working with other marketing and technical professionals. We are a growing and evolving company managing multiple ecommerce websites across various industries as well as many proprietary brands. There’s never a dull moment when you are developing strategies and implementing them across some of the largest ecommerce destinations in USA. The Conversion Strategist is responsible for driving incremental performance of ecommerce platform for one of the largest online stores in US. Conversion Strategist is expected to provide recommendations based on best practices, and design, prioritize and execute A/B testing. In this position, the employee will be charged with the ongoing assignment of identifying opportunities to improve KPIs across the most impactful avenues (including technology, acquisition channels, and key conversion funnels). The Paid Search Specialist position offers the opportunity to manage a multi-million dollar ad-spend for multiple properties of our US-based customers, competing for best performance with the likes of Amazon, Cabelas, Zappos and other e-commerce giants. You will be creating large campaigns and bidding strategies, analyzing performance and expanding our customers' paid search reach within the market. The position is in Riga, Latvia. Are you an experienced Quality Assurance (QA) engineer that would like to join a growing development team that works on large eCommerce projects in a fast paced environment, taking your skills to the next level? We're looking for a candidate interested in testing desktop and mobile websites as well as native mobile applications (iOS and Android) on every device which we have. Experience in automated testing is a big plus! From interns to seasoned professionals - you will never feel bored, working with us! Working with us, you'll have a chance to master a lot of cutting edge technologies, research new technologies and gain experience in usage of those. Our rule is finding existing tools and mastering them instead of reinventing the wheels. We also keep our projects up to date with the recent versions of the software we're using. We have a great team of friendly professionals working together on solving challenging tasks. You'll have a chance to learn a lot from your colleagues. 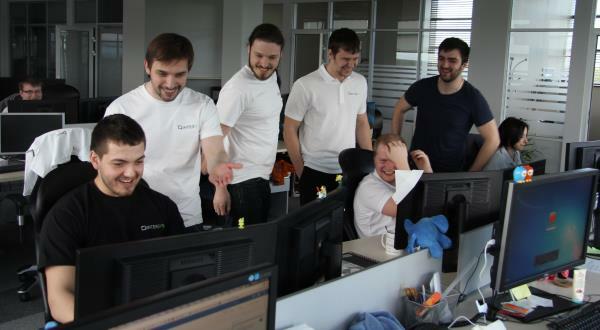 We hold internal demos and talks every few weeks and dedicate time for knowledge sharing. We spend a lot of time at work, and that's why we're making sure that being at work is enjoyable. Flexible schedule, dedicated recreation space with darts board, novus table and comfortable sofas are always at our disposal. We spend time together, doing sports, travel and other activities. We stay in the office for board games every few weeks. Professional growth is our focus. We share knowledge, we attend conferences, both as speakers and just attendees. We always learn something new and are eager to try it in our projects.